When Gov. BRUCE RAUNER was in Naperville on Thursday and talked to reporters about a bill he approved concerning police pensions, he made a familiar claim. I have wondered about Rauner’s repeated claim, in absolute terms, about the lack of reforms, as he has made his way across the state signing bills that sure seem like they contain some of what he wanted. I asked state Sen. DON HARMON, D-Oak Park, chief sponsor of the procurement bill, about the Republican governor’s continued claims of no reform. Harmon added that he and a chief co-sponsor, Sen. PAM ALTHOFF, R-McHenry, negotiated in a bipartisan fashion, and the bill was largely done months ago. “But the governor didn’t seem to want the reforms when we agreed to them because he wasn’t getting everything he wanted in all other areas,” Harmon said. Riley said he too was involved with bipartisan negotiations on the bill, including having “hearings all over the state,” and the final product eased some restrictions put on state purchasing following excesses seen in the era of now-jailed Gov. ROD BLAGOJEVICH. The new law combined streamlining with still-needed safeguards, Riley said, and he noted that in its final version, it passed with no one voting against it. Rauner also has been critical of the income-tax increase in the budget, which brought the rate on individuals from 3.75 percent to 4.95 percent. 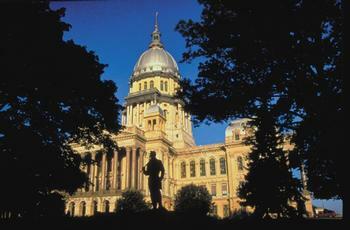 But before the budget was passed, Republican lawmakers had presented a package called the Capitol Compromise that they said Rauner agreed with, and it included the same income-tax increase level, but for four years, not permanently. There were of course other things — “reforms” — in that package that the governor also wanted.